Due to the unprecedented success of its debut event, Bullitt Hotel is set to welcome back Belfast’s four-legged furry friends and their owners for another session of their new favourite pastime, doga. 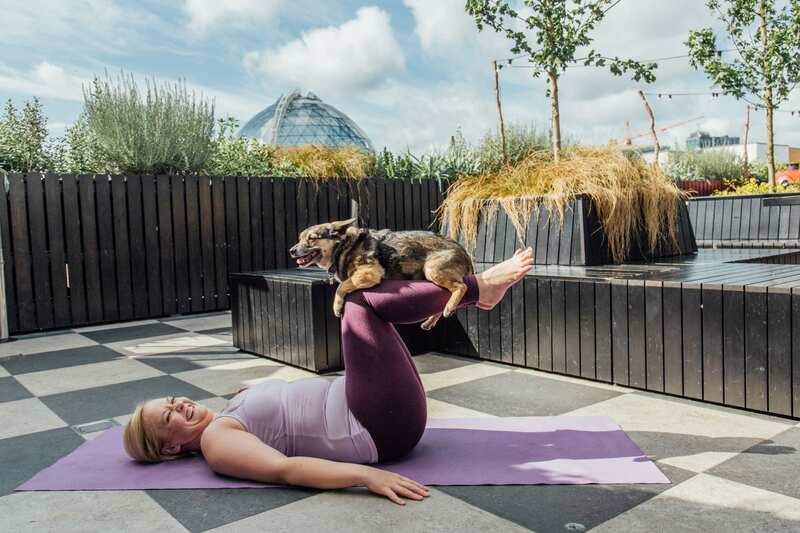 Bullitt Hotel is the first venue in Belfast to host the growing trend of practising yoga with your dog, with its debut session in August being a sell-out event. A total of 12 dogs eagerly made their way up to the rooftop for the hour-long class, which concluded with some doggy treats and a gentle massage. Check out the doga taster video below! The doga class, which involves man’s-best-friend joining their owner in a unique type of yoga practice, will take place in the ambient surroundings of Bullitt’s rooftop bar and garden, Babel. Pet pooches can take a break from playing fetch and instead enjoy some quality time with their owners, while participating in some traditional yoga stretches and meditation techniques. “I’ve been teaching yoga for over eleven years, but a doga class is definitely a unique kind of practice. I was overwhelmed by the success of the first event, we had a full class and everyone – especially the dogs, enjoyed it. I’m looking forward to taking round two of doga in September, for those who missed out on the debut class. Doga at Babel Rooftop Bar will return on Sunday 23rd September 2018 and the doga practice will commence at 10.15am until 11.30am. To book online or find out more, visit bullitthotel.com, email info@bullitthotel.com or follow Bullitt Hotel on Facebook @BullittBelfast or Instagram @BullittBelfast.